While we were in the Denver area, we had a moment during the afternoon to visit the city’s Ocean Prime location (a second location will be opening later this fall). We were able to drop off our car at the valet without much in the way of hassle – Larimer, the street that the restaurant was on, was busy but the restaurant had placed the valet corral front and center to ensure one could easily get into Ocean Prime without having to hunt for a spot on the street parking. After getting our party together, we entered into Ocean Prime and were immediately greeted with an inviting and classically-designed facade. The greeter got us back to our table immediately. With a similarly-quick turnaround, we had our drinks and appetizers ordered. Ocean Prime had a nice spread of local craft beers; their beer menu provided ample information about the location of breweries. Whether a Belgian wheat from Avery, a pilsner from Oskar Blues or a vanilla porter from Dry Dock, one can be sure that the beer is well-crafted and provides further Colorado focus to a night at Ocean Prime. 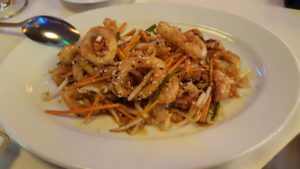 The Point Judith calamari ($19) was sublime, linking together the succulent and massive calamari rings with a carrot-forward slaw. Ocean Prime’s Lobster Roll ($19) is similarly large. 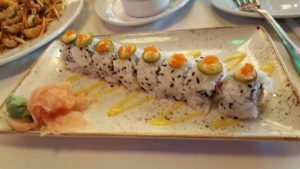 The balance of the poached lobster tail with masago was layered nicely with a bit of heat (pickled serrano peppers) and sweet / fruity tastes (pureed mango with a hint of spiciness and kiwis). 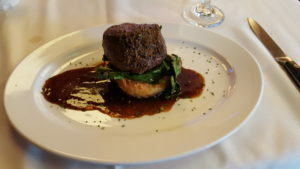 The 6 ounce filet mignon steak ($31) was masterfully trimmed cooked to perfection. The steak came with a gouda-infused potato smear and a bit of spinach with a spicy tang. Our daughter was able to find something to tuck into as well. 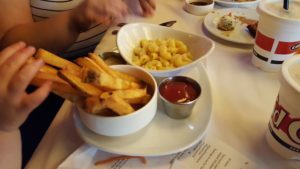 The fries were long and easy for her to dip in the ketchup, while the mac & cheese’s portion was substantial enough to keep her kicking well into the night. 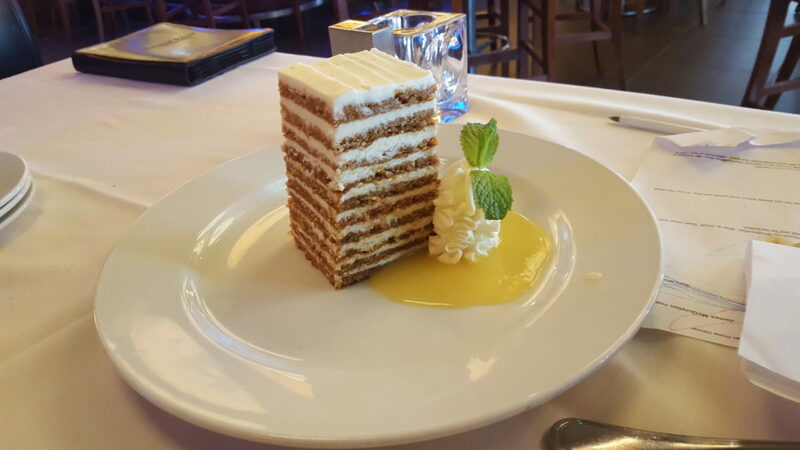 The Mile High Carrot Cake ($14) was nearly as tall as its name would indicate. Care was taken in making this piece of decadent heaven look as orderly as all get out. A mild cream cheese icing worked to invigorate the carrots, while a bit of pineapple syrup meant that even after all of the food we had consumer previously, we were able to hoover even the fleeting crumbs from the plate. Overall, we enjoyed our visit to Ocean Prime during their lunch rush. The service was top-notch, the food was promptly sent out at the correct times, and the restaurant was immaculate. Ocean Prime is open from 11:30 until 10:00 PM Mondays through Thursdays, 11:30 to 11:00 PM on Fridays, 4:00 until 11:00 PM on Saturdays and from 4 until 9 PM on Sundays.